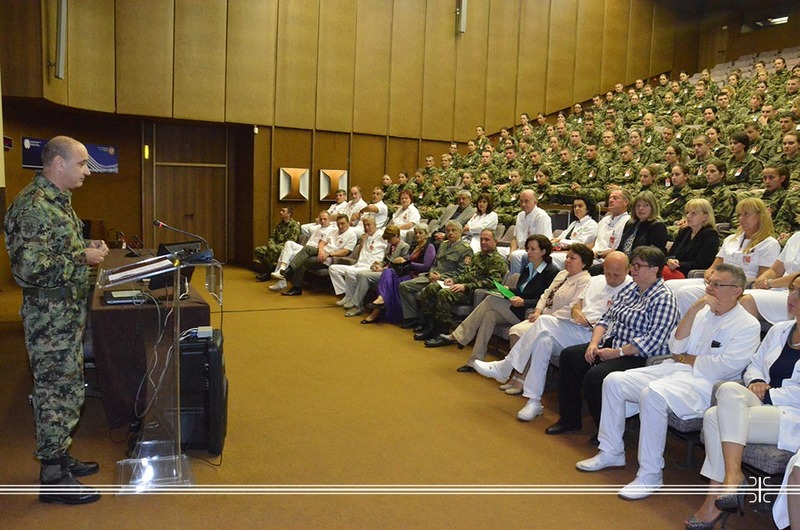 On the occasion of the new school year 2016/17 a ceremony was held for the cadets of the MMA’s Medical Faculty, University of Defence in Belgrade in the amphitheater of the Military Medical Academy. Deputy Head of the Military Medical Academy Colonel Prof. Dr. Dragan Dincic congratulated the cadets the start of the new school year, and said that the MMA's Medical Faculty has become a recognizable, effective "producer" of young doctors, future top intellectuals, and committed officers of the Serbian Armed Forces. He conveyed that knowledge is the only real power, and that he is looking forward to the coming years at the Faculty; years that include fresh knowledge, passed exams, research papers and all other challenges that await future military doctors. Dean of the Medical Faculty, Col. Prof. Dr. Nebojsa Jovic wished a new class of cadets a happy start of their education, and other classes a successful continuation of studying. He said that the modern teaching with an emphasis on interactive group work has shown so far excellent results. In particular, he mentioned a mentoring approach in studying that, in addition to medical subjects identical to civilian medical faculties, includes the continuing military training and acquiring the skills of various sports. Associate Dean for integrated academic studies of medicine of the MMA’s Medical Faculty Prof. Dr. Milica Ninkovic announced new mentors for the eighth class of cadets who today started their education at the Faculty.